This sequel is set to make a killing at the box office, and I’m sure it will opening weekend, but I imagine word of mouth after that will drive sales down. That’s not to say that this is a poorly made movie, or even that it’s not an enjoyable film. On the contrary, it’s a very enjoyable film, it just dragged a bit, and I’m sure that’s why Marvel filmed some extra scenes with Loki, which were sorely needed this time around. And director Alan Taylor does his best with the big steaming head of Marvel looking over his shoulder constantly. I’m not sure who really is to blame for this sequel’s dragging pace and missed opportunities, but with an excellent third act, all is pretty much forgiven. As we see in the opening scene, which is a very early epilogue, is a battle with creatures known as the Dark Elves, who look very creepy on a planet called Alfheim, who were actually existing before the beginning of time. Their big weapon against everyone and everything is called Aether, which is a black and red gas like substance that can destroy all. However, the Dark Elves are seemingly all killed by Thor’s grandfather, but a few manage to escape. Cut to present day, which is literally right after the ‘Avengers’ film as we see Loki in handcuffs awaiting his sentencing for destroying New York by King dad Odin (Anthony Hopkins). He is sentenced to the rest of his life in the Asgard dungeon with all of the other criminals from the other worlds or realms, which his cell resembles something similar in X-Men or any other futuristic movie, with white walls, and fancy furniture, and a glass like window instead of metal bars, where he has genuine conversations with his mother Frigga (Rene Russo) about their relationship and love, and who finally gets a bit more action and character this time around than the first film. 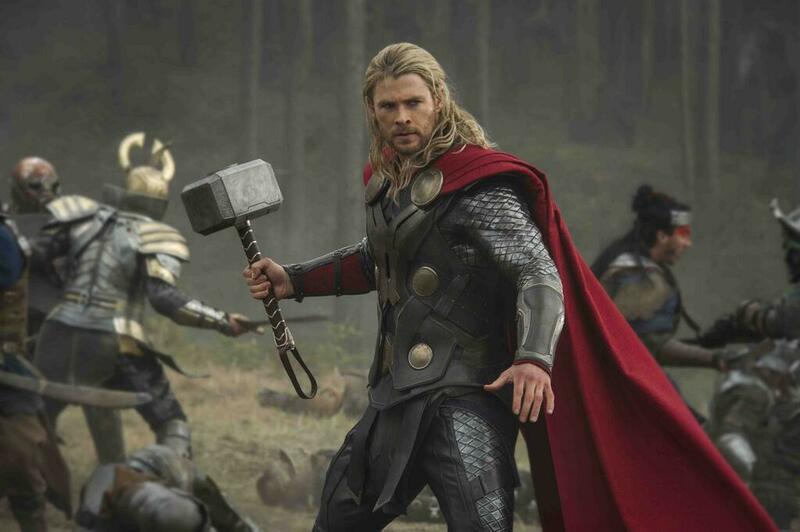 Since the Bifrost bridge that connects Earth and Asgard was destroyed in the first film, Thor and his love interest Jane Foster (Natalie Portman), have not seen each other, as Thor and his small army of friends are keeping the peace on other realms. But Thor checks in from time to time with the gate keeper Heimdall (Idris Elba) who can see that she is doing alright, and even on a date with Richard (a under-used Chris O’Dowd). But when her intern Darcy (Kat Dennings) interrupts her date with news of some space anomaly that is similar to the first time Thor appeared, Jane is sucked into a different realm and the Aether enters her body, giving her some powers. 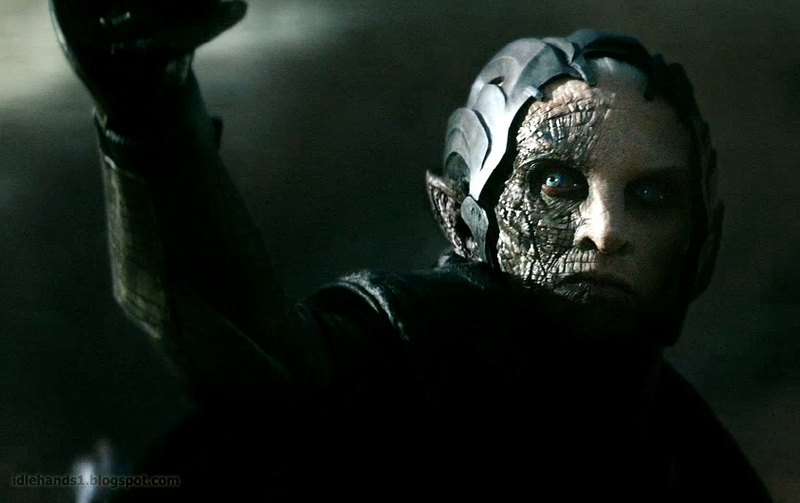 As this happens, the remaining Dark Elves are awakened and led by Malekith (Christopher Eccleston) to retrieve the Aether and destroy the universe. With the cutting between the Dark Elves plotting war and the Asgardians and Earth, all becomes a bit jumbled and messy. 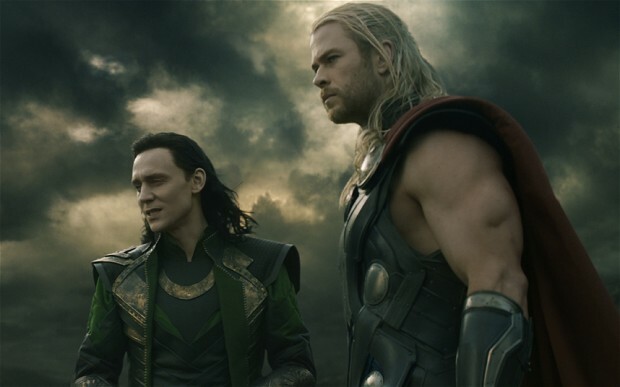 As Thor takes Jane to Asgard to seek help and meet the family, it’s clear that the Dark Elves mean business and the only one who can seem to help out is Loki, to which against better judgement is freed from prison and asked to help defeat the bad guys. It’s only here with Loki, when the film sparks new life, that is until the final battle in Greenwich, London, where buildings are destroyed, and Earth, Asgard, and The Dark Elves square off. With the great character of Dr. Erik Selvig (Stellan Skarsgard) and Loki delivering great one-liners, the sequel finally finds its footing, and becomes the movie it needs to be. Director Allen Taylor has directed some of the best episodes of the best television shows of recent memory including ‘The Sopranos‘, ‘Mad Men‘, and ‘Game of Thrones‘. He seems to do a good job here without the advantage of having several hours worth of plot development, but again, Marvel is known for clashing heads with the creative types. And editors Dan Lebental and Wyatt Smith deserve some mention here, especially in the final 15 minutes of the film, as the battle travels between realms quite often, and the timing with this is flawless. And Brian Tyler’s score is excellent, as it always adds some great suspense and emotion into every scene. I definitely need this soundtrack. And be sure, as always, to stay till the very end after credits roll. As there are not one, but TWO extra scenes that might make you scream and laugh. This entry was posted on Thursday, November 7th, 2013 at 11:14 am	and is filed under Film, News. You can follow any responses to this entry through the RSS 2.0 feed. You can skip to the end and leave a response. Pinging is currently not allowed. Nice review Bryan. Strange that we would get this superhero movie at the beginning of November, but still well worth the watch. Thanks, Dan. Would you purchase this on blu-ray when it comes out? « ‘Films to See in November’! !